Honto is giving away a large selection of their eBooks (including manga, light novels, novels, magazines, etc) for free to promote their eBook business for a limited time. Some popular titles include “Your Lie In April (四月は君の嘘),” “Attack on Titan – Before the fall (進撃の巨人),” “Rurouni Kenshin (るろうに剣心 )”. They are mostly first volumes, but a great selection nonetheless. For full download list, click here: http://honto.jp/cp/ebook/recent/free.html. For any catergories you’d like to view more of, click on the text “無料の電子書籍をすべて見る” underneath that section. Either way, they’re free; no strings attached. All you have to do is add the eBooks that show up as 0 yen in cart, and go through checkout. (It takes 2 clicks). Afterward, you can access them by opening up the honto app on your device and it should show up on your shelf. Here is a summary of all the deals going on at Tokyo Otaku Mode for the month of December. This upcoming event is the TOM Santa giveaway which only accepts entries from Dec 7-9. Everyone who enters their giveaway will get a $5 coupon for orders with a total of at least $50 (coupon is automatically added after Dec. 9 and will expire on Dec. 31). Remember that if you use my referral link to register for an account, you get $5 in TOM Points as well. In order to enter the giveaway, you need an account, then add at least $500 worth of in-stock products into your wish list (no pre-order or made-to-order; can be from any warehouse). Share the list on a social media site, and you have a chance to win up to $500 worth of products on your wish list! Full event details here. Best of luck and Happy Holidays! Looks like Otaku Mode is running a special invite campaign again, so if you haven’t already, sign up with this link, and you’d get $10 in TOM Points as opposed to the normal $5 :). If you haven’t heard about them, I’ve posted a review of my first order and have ordered a number of things there afterward. Great value and fast shipping! 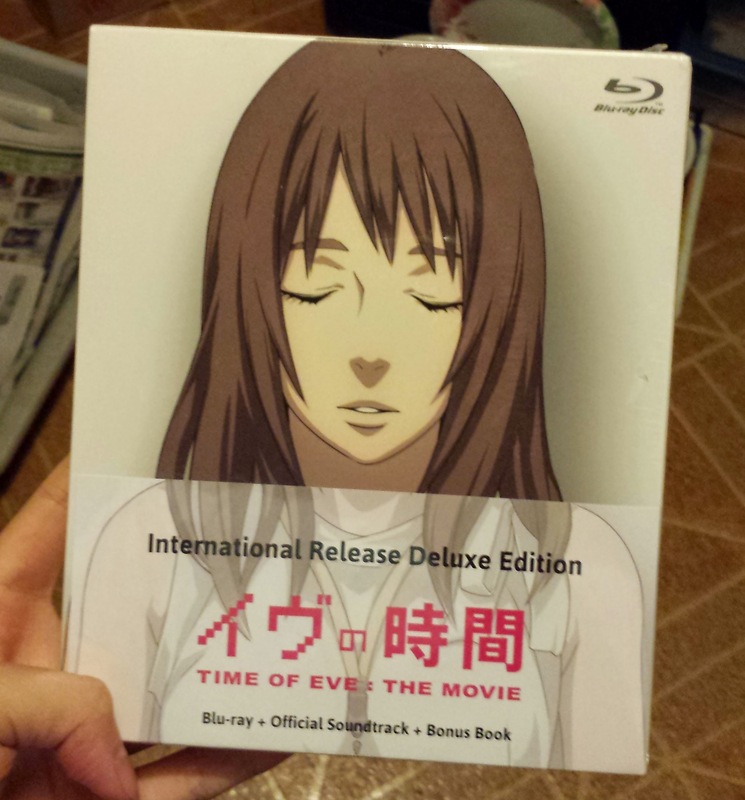 I backed Time of EVE: The Movie on Blu-ray by Pied Piper / DIRECTIONS / Studio Rikka last year and just recently received my Blu-ray with the extras :). They were behind schedule in delivering the product, but they were always connected with their fans and genuinely cared about what the fans wanted out of this project. Their commitment to the quality of the project and their fans have been amazing from start to finish. They’ve spent a lot of time refining everything from the obi down to the postcards. And I’m happy to share that they’ve started selling these Blu-rays to the public on Right Stuf. This is an excellent anime movie that I highly recommend it. The storyline, concept, and art is very interesting and well-done. I only wish they would make a continuation for it, because their world has so much that can be explored. For those who’ve already bought the Blu-ray, isn’t it great?! Both versions come with the Soundtrack CD and the Deluxe version comes with a bonus art book. They’ve also managed to get enough funding to support a long list of subtitles in multiple different languages, so a vast majority of the population can watch and enjoy this anime! If you are already a fan of the movie, they are also getting a light novel extra called, “Time of EVE: Another Act” translated, so don’t miss out on it. It’s a limited time offer. Free Shipping Over $100 at Otaku Mode! Awesome news! Otaku Mode is offering free shipping on all orders over $100 now! This makes ordering a lot easier; previously, it was a $200 min. for free shipping. Now it’s $100. Plus, it’s EMS shipping from Japan and USPS if the products are in their US warehouse. Using my link to register would give you $5 off your order :). Great news for US otaku fans! Otaku Mode has recently opened up a new warehouse in the US. This means that for US customers, it would be faster (and cheaper) if you buy products that are already in their US warehouse. I believe this would be mainly for products of popular series such as Dragon Ball, One Piece, Naruto, and Gundam. On the other hand, that also means that if you purchase products from both US and Japan in one order, the packages would have to be shipped separately (I imagine shipping costs would also cost more). Again, if you register with my link, you could get $5 off your order :).